The Volusion Toolbar will look different depending on whether you're viewing your storefront or the Admin Area. When viewing your Admin Area, the Volusion Toolbar will always appear above the main navigation menu. Note that this feature cannot be turned off, and will always display when you are logged in as an administrator. Click the blue V icon on the far left to return to your store's main Dashboard page at any time. Hover over Get Help to expose a drop-down menu with quick links to additional resources. 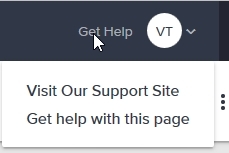 You can visit our support site directly, or click Get help with this page to view any specialized help content for the page you're viewing. 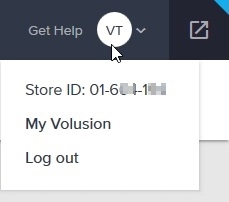 Hover over a logged-in administrator's initials to expose a drop-down menu with your customer support pin, as well as quick links to access your MyVolusion account or log out of your Admin Area. The Publish button will only appear if you have the Config Variable Enable Immediate Publish disabled (unchecked). When this variable is unchecked, changes you make under the Design tab in the Admin Area may not be pushed to the storefront immediately. The Publish button appears on the right side of the Admin Area navigation menu when you have pending design-related changes. Clicking it will publish your changes to the storefront. Visit Settings > Config Variables to find and enable immediate publishing to your storefront (this will eliminate the need for the Publish button, since all changes will go live on your storefront immediately). At the far right end of your toolbar, you'll see a toggle button that lets you easily switch the view to your storefront. Click this icon to go to your store's homepage. 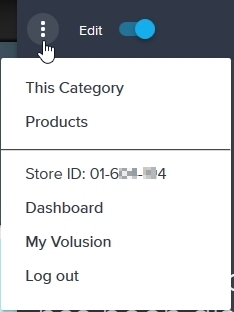 When viewing your storefront, you'll see a collapsed version of the Volusion Toolbar, represented by an arrow icon in the upper-right corner of the page. Click the arrow icon to expose additional editing tools; a new panel will appear on the right side of the page. If you're on a storefront page that contains editable article content, you can use the Content Builder to make changes. If the page you're viewing doesn't contain any articles, you'll see a message that the Content Builder is disabled for that page. When you click to expand the storefront editing panel, you'll see several options near the top: an "x" icon to hide the panel, a three-dot actions menu to expose more tools, and an Edit toggle to enable and disable storefront editing. Hover over the three-dot icon to expose a drop-down menu with quick links to the Admin Area pages most relevant to the storefront page you're viewing. If you're viewing a category page, for example, you'll see a link to directly edit the category (This Category) or view and edit the list of products applied to that category (Products). You'll also see your customer support pin (which you'll need if you contact our Support team), along with quick links to your Dashboard My Volusion account pages and a Log out link. The Edit switch activates the storefront editing functionality for certain text articles and image elements on the page. If you're viewing an article page, you can swap and edit images using the Content Builder. If you want to edit theme-based images on the page, such as buttons, first make sure that the Edit switch is enabled in the storefront toolbar. Next, hover over the button you want to replace and click Edit. In the Image Swap window that appears, you can browse your computer for a file and click Upload, or you can drag and drop a new image into the window. Note that any image you upload here must be a .gif file type. For more ways to edit text and images on your store, see "How to Use the Easy Editor". Whenever the Edit switch is enabled in the storefront toolbar, you can modify certain page text directly from your storefront. Hover over the text you want to change for all areas on the storefront. Once you see the area outlined in blue, click Edit. You'll know that you're ready to edit the content once you see the blue dotted line appear around the content area. For individual Page Text values on the storefront, a blue dotted line will appear around the words you've chosen to edit. Once you've made changes to the text, click the check mark to save the changes. If you don't want to save the changes, click the "x" to cancel editing. In some cases, the text you're editing may also have formatting applied. If the text is formatted (for example, if inline tags are in place to make the text bold or a different color), you'll see a pop up message with a link to edit the text in your Admin Area in order to preserve formatting. If you don't need to retain formatting, you can still edit the text by typing directly into the outlined editable region. Some Page Text values include dynamic variables as part of the editable text. In these cases, hovering over the text will produce a popup with a direct link to the specific Page Text ID in your Admin Area. You can add or remove variables that are part of a Page Text value, but note that altering them may remove functionality. To see the intended function of a Page Text variable, click the tool tip for more information. The tool tip also shows the default text and variable(s) for that Page Text value, in case you need to revert. If the text you want to modify is contained in an article, you can use the Content Builder to make changes. If the Content Builder is unavailable for the article you're viewing, you'll see a message with a direct link to edit the content in your Admin Area. Edit the article text, including font, size, and color. Edit the raw code for the article text by clicking the HTML icon in the Easy Editor toolbar. Add hyperlinks to text by clicking the Link icon in the Easy Editor toolbar. Insert images by clicking the Insert Image icon in the Easy Editor toolbar. Click Save to make your text changes live on the storefront, or click Cancel to discard your changes.